A councillor collected 200 discarded syringes from near a children's play area after being told the local authority could not remove them. They were discovered in an alley near Rhosddu Park in Wrexham and reported to council officials by a resident. However, after being told staff could not clear them, Plaid Cymru councillor Marc Jones stepped in. 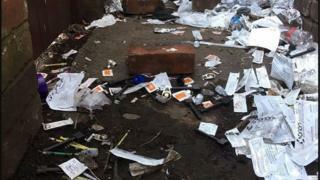 Wrexham council confirmed its staff were not required to collect drug paraphernalia from private land. "The health board hands out needles on the basis that it prevents diseases spreading," Mr Jones said. "I agree with this but expecting people leading chaotic lives to dispose of needles safely is irresponsible. The back alley is testament to that. "Safer places are needed, both for the community and users." He called on Betsi Cadwaladr University Health Board to work with the council and North Wales Police to tackle the problem, according to the Local Democracy Reporting Service. Currently, it operates an exchange scheme where thousands of needles are handed out each year in an effort to reduce the risk of infection and injury. Carole Evanson, from its regional specialist services team, said it worked to promote responsible behaviour. Is there a drug problem in Wrexham? She added: "One discarded needle is one too many, which is why we actively encourage drug users to return their used injecting equipment not only to protect themselves, but their friends, family and the wider community." Wrexham council's lead member for environment, David Bithell said a special task force was set up last year to look at the problem. "The council does have enforcement powers to prosecute landowners that allow litter to accumulate on their property, and this can be actioned by the public protection department," he added.